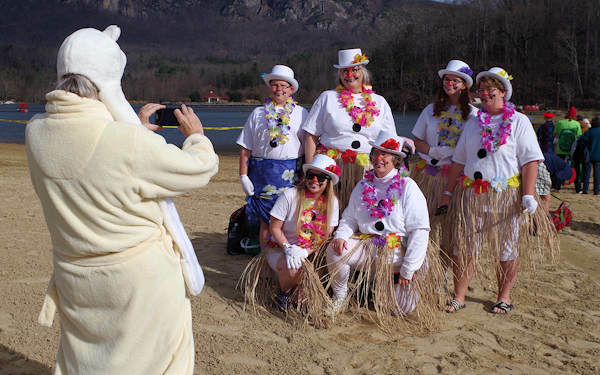 Hundreds of brave (and crazy) people take the 11th annual New Year’s Polar Plunge at Lake Lure and freeze for a reason – to support local first responders. Many more come to watch the fun, complete with bonfires to keep warm! 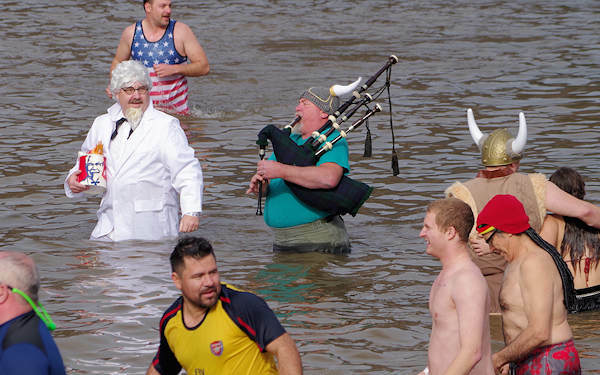 The chilly dip takes place on New Year's Day at 12 Noon. Registration is 10 until 11:30 AM. It's a very festive time with fantastic costumes and music. 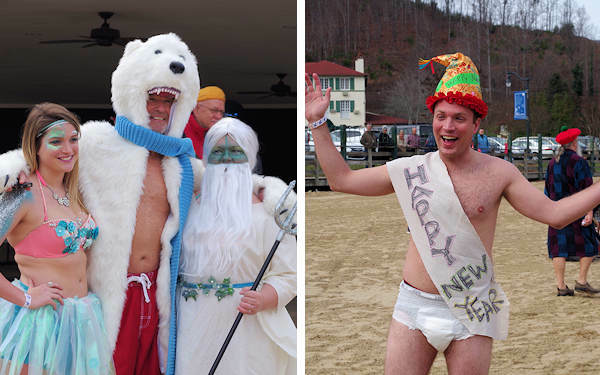 Events will all be outdoors at on the beach (2724 Memorial Highway, Lake Lure). Hats off to plenty of fun costumes and originality. It proved to be a tough job for the judges to pick the winners. Bring your camera to capture great memories. 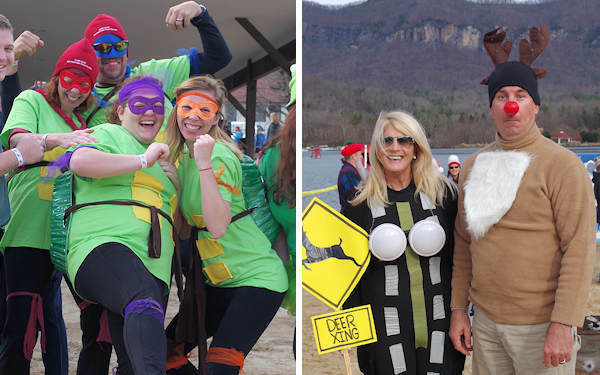 Prizes were given for best costume, youngest, oldest and plunger who traveled the furthest. Love the Ninja Turtle and the deer in headlights! Is that Darth Vader? 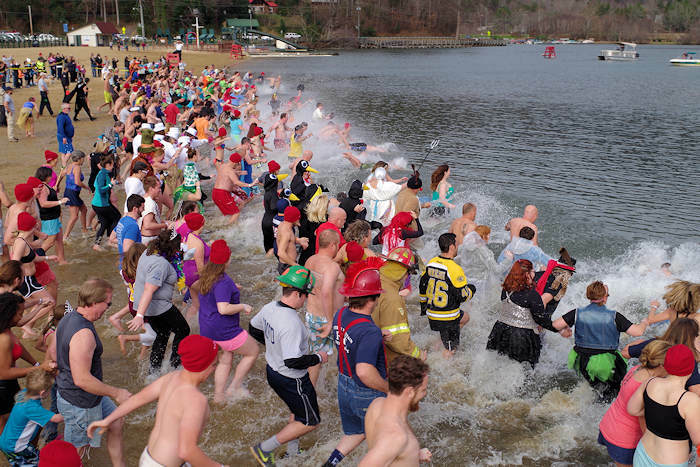 This year, a portion of the proceeds will benefit our Lake Lure Fire and Rescue along with other first responders. Come early to enjoy the excitement and good times. There is no admission fee for spectators. 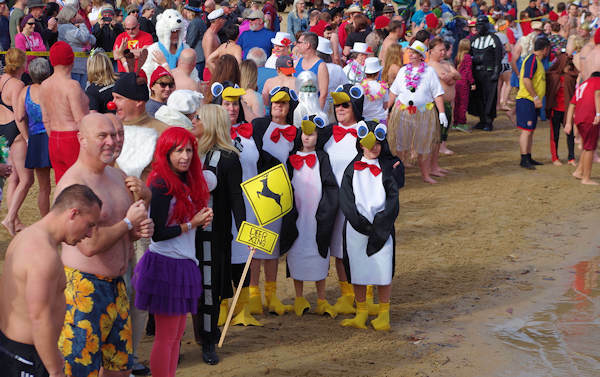 Waiting to run into the water - the penguins had a slight advantage at the Polar Plunge. 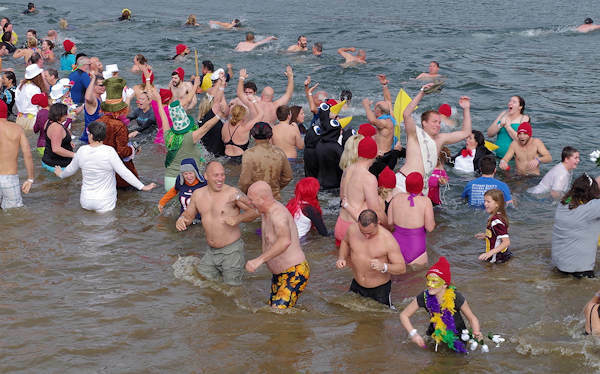 Many made a quick dash in and out, while others splashed around and took a swim. 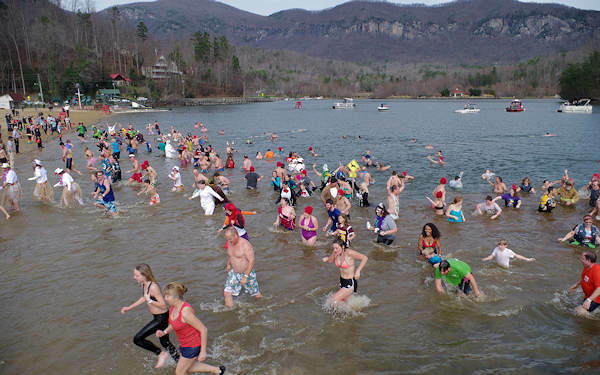 Lots of screams, laughs and victory signs in the 45-degree water of Lake Lure. 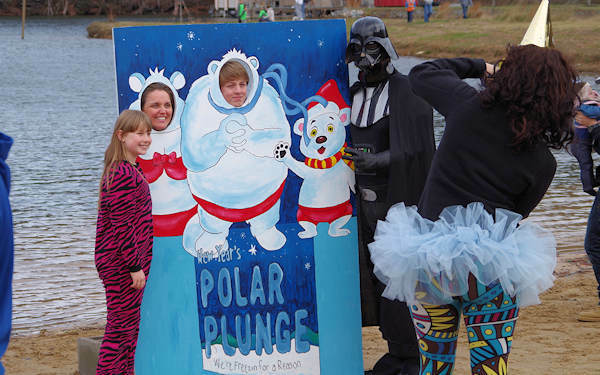 The plunge started eight years ago with just 23 plungers. Yes, that is a Viking playing bagpipes (Rocky Top) with Colonel Sanders. The cost of the Plunge is just $20/person. Proceeds support Lake Lure Fire & Rescue and Hickory Nut Gorge EMS. They will have towels and sweatshirts for sale. Directions: It is located about 27 miles from downtown Asheville. Follow I-240 East to Exit #9, Highway 74A East to Bat Cave and continue on Highway 74A to Lake Lure. Nearby is Chimney Rock Park. Order a free copy of the award-winning travel guide to the Rutherford County foothills that includes Lake Lure, Chimney Rock, Rutherfordton, Forest City and much more! There's a lot happening in this lake town! In addition to a beach to keep cool on hot summer's day, there's a wonderful Town Center Walkway that connects the beach to the beautiful Flowering Bridge. Take a boat tour of the lake or bring your mountain bike for their new trail system at Buffalo Creek Park. See breathtaking 75-mile views of the Blue Ridge Mountains, Hickory Nut Gorge and Lake Lure. 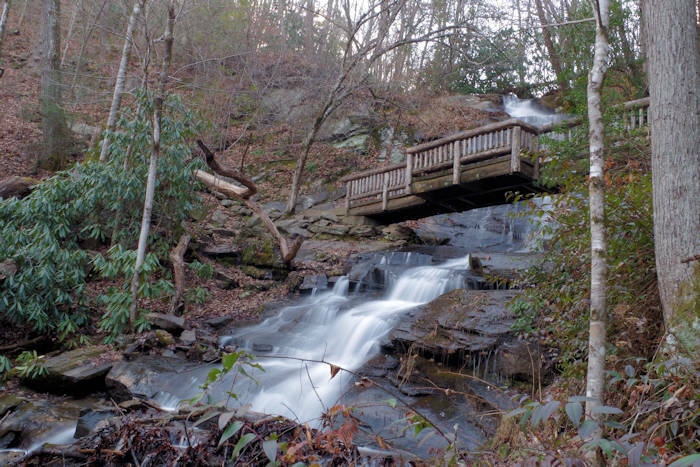 The park also features a magnificent 404-foot waterfall and hiking trails. Shopping and dining located at the park entrance. 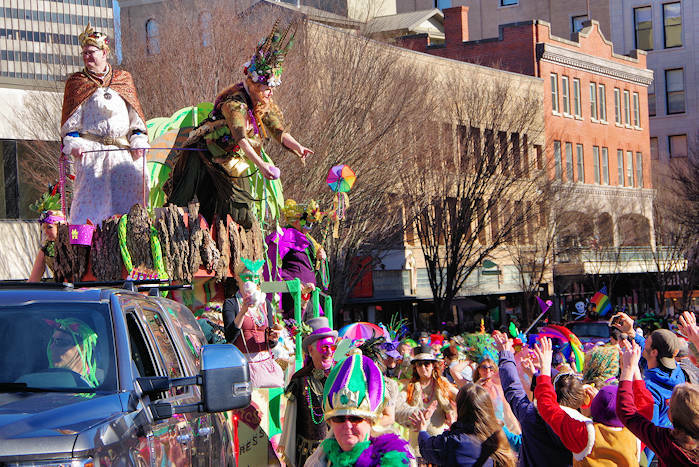 Head to downtown Asheville for many dining and entertainment choices or go to celebrations throughout WNC. Special events on Jan 1st too. 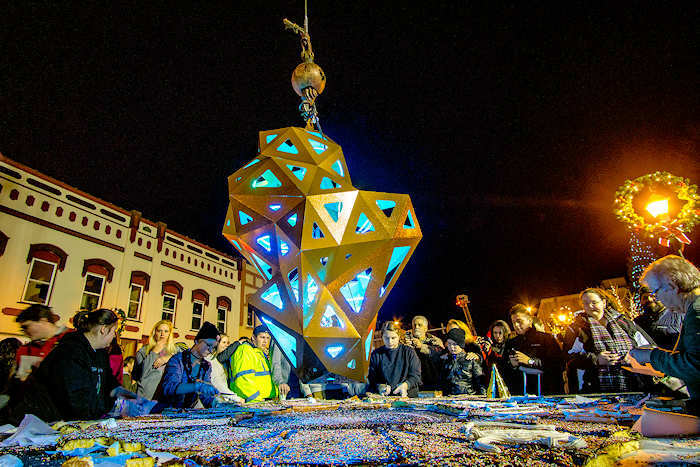 See our top New Year Celebrations and Things to Do. Go to a state park near Asheville for a free guided hike with a forest ranger - a great way to begin a resolution to get outdoors for exercise and education. Most are easy trails, perfect for all ages and fitness levels. See our top picks for things to do and events in January, February and March - including Valentine's Weekend! Watch our quick video of the big splash!